On May 25th, student at Booker T. Washington High School in Miami got a chance to meet Hall of Famer Larry Little and learn how his childhood in Miami shaped him into the successful football player that he is today. Little signed as a free agent with the San Diego Chargers in 1967 and was traded two years later to the Miami Dolphins. Little immediately won starting right guard job and was the epitome of powerful Dolphins rushing game of the 1970s. He was All-Pro six years, a five-time Pro Bowl pick and a three-time NFLPA pick as AFC Offensive Lineman of Year. Little started in three Super Bowls and was enshrined into the Pro Football Hall of Fame in 1993. The 500-person crowd included his 96-year-old mother, other family members, students, teachers, and the school’s marching band. Larry Little and some members of his family, who attended the 102nd Hall of Fame ceremony. 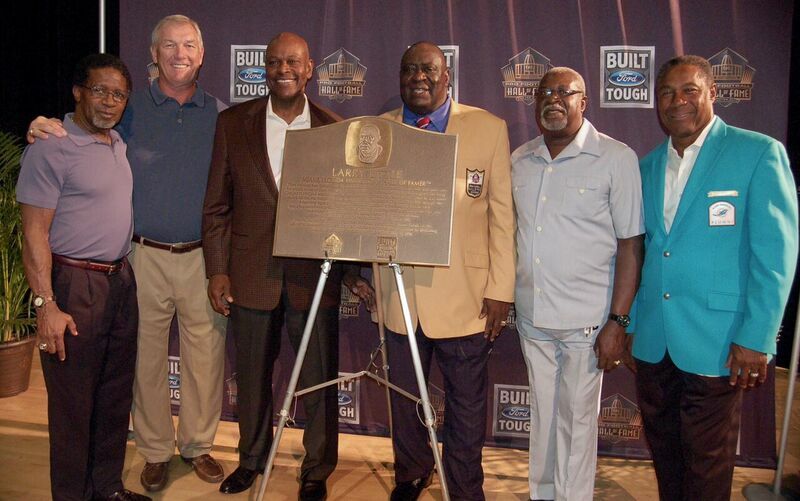 Also on hand were fellow Hall of Famer Dwight Stephenson and several other Dolphins legends Nat Moore, Eugene Milton, Larry Ball and Mercury Morris. 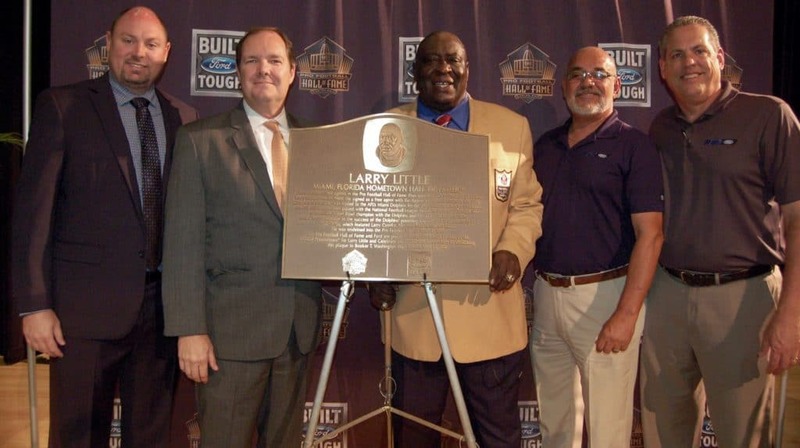 The Pro Football Hall of Fame and Ford Motor Company paid tribute to Gold Jacket Larry Little at his high school alma mater as part of the Hometown Hall of Famer™ program, making this ocasion the 102nd ceremony. Larry Little and representatives of South Florida Ford at the ceremony. Hometown Hall of Famer™ is a national program that honors the hometown roots of the greatest heroes of the football game with special ceremonies and plaque dedication events in local communities. 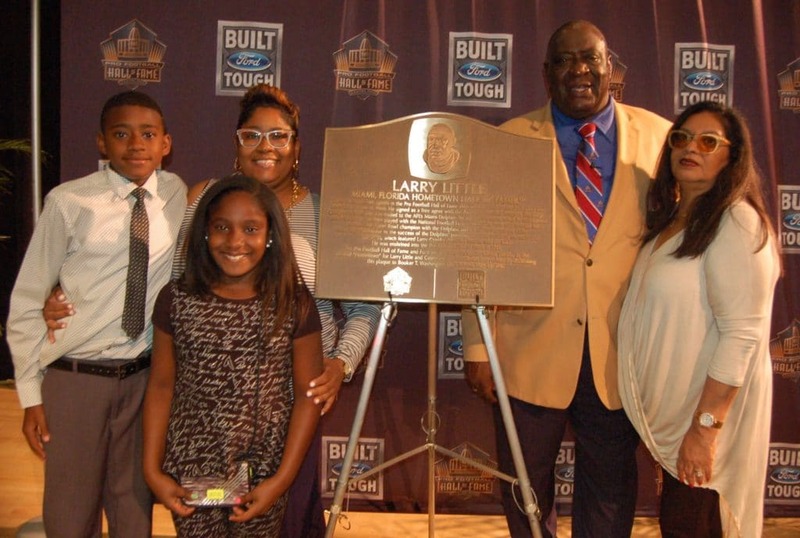 The plaque given to Larry Little will live permanently at Booker T. Washington High School. In addition to the plaque, South Florida received two commemorative Hometown Hall of Famer road signs to proudly display. 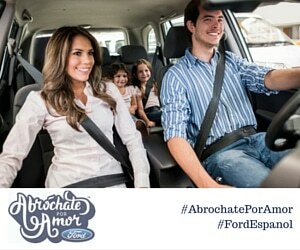 This entry was posted in Body, For Teens, Raising Tweens, Teaching & Education Tips and tagged football, Ford, Pro Football Hall of Game, raising tweens, sports. Bookmark the permalink.